The 107-LC consists of a thermistor encapsulated in an epoxy-filled aluminum housing. It measures the range of -35° to +50°C; to measure the -5° to +95°C temperature range, see the 108-LC probe. The 107-LC consists of a thermistor encapsulated in an epoxy-filled aluminum housing. Its cable terminates in a connector that attaches to the ET107 Weather Station, ET106 Weather Station (retired), or MetData1 Weather Station (retired). 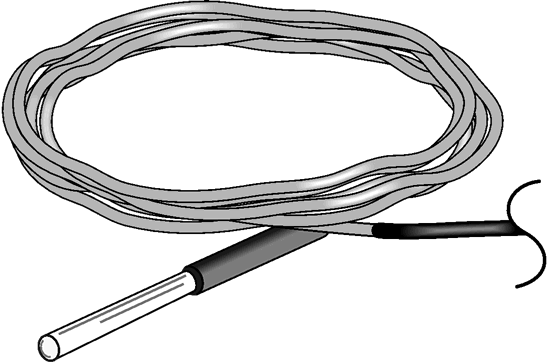 The 107-LC measures the range of -35° to +50°C; to measure the -5° to +95°C temperature range, see the 108-LC probe. The 107-LC is suitable for shallow burial only. It should be placed horizontally at the desired measurement depth to avoid thermal conduction from the surface to the thermistor. Placement of the sensor cable inside a rugged conduit may be advisable for long cable runs, especially in locations subject to digging/mowing, traffic, use of power tools, or lightning strikes. p>The 107-LC can be submerged to 50 feet. Please note that the probe is not weighted. Therefore, the installer should either add a weighting system or secure the probe to a fixed, submerged object, such as a piling. The cable of the 107-LC provides a connector that attaches to the ET107 Weather Station, ET106 Weather Station (retired), or MetData1 Weather Station (retired). The ET107 Weather Station has an on-board CR1000M module. Both the MetData1 Weather Station and ET106 Weather Station have an on-board CR10X module.